Yesterday morning our resident peregrines were excited by the presence of a third peregrine falcon. Initially Rebecca was on the nest incubating the eggs and was alerted to the intruder by Kewpee. Rebecca then left the nest to chase off the third bird while Kewpee took over incubating the eggs. The whole skirmish was over in about a minute. I suspect that the stranger was a female, which is why Rebecca was called into action to chase her away. 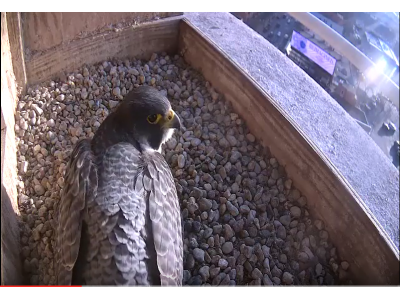 There is a short video clip that captures the reaction from the nest box. Other than that, it has been very quiet in the nest box. Both Rebecca and Kewpee have been diligently keeping the eggs warm and covered. We are looking forward to hatching in about a week. The Parapet camera is still down and we will not attempt to repair it while the birds are in the nest. So, unfortunately, we will have to do without for a while.